Мъжки маратонки, произведени в Унгария, 43 номер, на склад Diese farbenfrohen Sneakers .. The Mens Kappa Persaro Trainers have been constructed with tonal stitched detail across the upper te..
- Litewave Endurance provides a soft landing and smooth transition to make it the right choice for b.. The ultimate shoe for the hardest trail running courses features a waterproof Gore-Tex membrane and ..
Take technical trails at breakneck speeds in these runners that are purpose-built to maximize energy.. 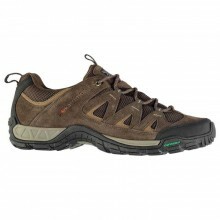 This rugged mid-cut hiker provides protection and support with a waterproof and breathable GORE-TEX .. The Karrimor Duma DNA Running Shoes are ideal for wearing whilst running indoors or outdoors. The tr..
A rigid, durable outsole and midsole support that limits pronation together with a ventilated tongue.. Designed for trail runners seeking maximum cushioning, combining a D30 Strobel Lasting which positio.. The Mens Karrimor Summit Walking Shoes are perfect for your next outdoor adventure, featuring a rugg.. The Karrimor Trail Run 2 Trainer Mens is perfect for all skill levels of runner, featuring.. The Karrimor Mount Mid Mens Walking Boots have been designed with breathable mesh panels t..